Your love is just a sip away. Spring is here, that means now is the perfect time to start chatting up all the other thirsty animals around the city in the hunt for spring flings and lay the ground work summer lovin'. And with the microbrewery scene in Montreal in full bloom, there is plenty of hoppourtunity for you to get cozy with some springtime sweethearts. Here’s a bunch of hip-hoppenin’ places for you to choose from to quench your thirst for summer, and treat your spring fever at the same time with an artisanal cold one. Don't let the airy concept of this modern Griffintown giant fool you. The open environment welcomes you with open arms, and their beautiful bar is made of one single piece of wood, giving it that extra touch of simple elegance. Their selection of big personality beers (just look into their eyes!) find inspiration in places from near and far. Your date will take an international detour with stops that could include Quebec, Belgium, South Africa, France, China, and Germany, just to name a few. But be careful not to lose your heads over the Mary Gallagher ghost-inspired, absinthe-based Ghosttown stout! Before you get to know each other in the biblical sense, check out this little devil. Their menu, aptly named the Bible of Beer, boasts around 850 beers (but who's counting?). With a selection that has something for literally anyone who even remotely likes beer, and its convenient centralized location near the Berri Metro station, this (place) has an infectious energy that makes it hard not to get the conversation flowing as easily as their faithful beer taps do. For nearly two decades, the folks at Brutopia have been making it easy for us to have a good time in a cozy environment. Made from locally-sourced ingredients, their modest array of natural regular and seasonal brews can range from the light and fruity Raspberry Blonde to the toasted, yet hoppy equilibrium of a Dark IPA, and beyond. And with pub grub, live music, open mic, and pub trivia nights galore, there is always something fun to do here to spice up any date night. No list of microbreweries in Montreal, no matter the context, would be complete without this godly addition. Their heavenly nectar is the thing of legends, and their reputation reaches far beyond the Quebec border. They're open until 3 AM every night, giving you ample time troll through their revolving selection of 17 craft brews of tap, and get to know that babe sitting across from you. So, take a leap of your faith and let the elixirs of this god take the reins on your budding romance. Relaxed and inviting, this Belgian-inspired pub makes for a great afternoon date. With a nice mix of their own brews as well as other local flavours on tap that they rotate on a regular basis, and a professional grade foosball table, there is no reason not to consider coming back here for your second date. If you find yourselves hungry for more than love, the menu has some comfort classics like smoked meats and poutines to nibble on. This cheery little number has been rocking the artisanal brew scene since 1996, and is well worth the visit. Enjoy any of the 22 house brews on tap and an eclectic mix of comfort snacks to choose from from a perch right on the Saint Dénis sidewalk and enjoy ogling the passersby between stolen glances with the apply of your eye. 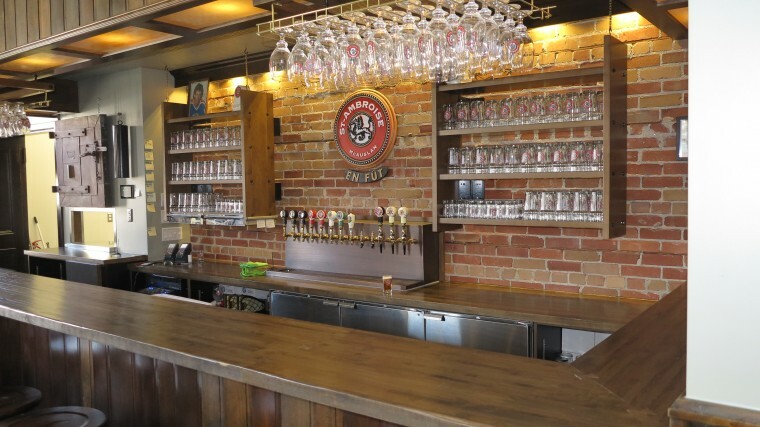 The 36 choices that this cool Little Italy haunt is rocking on tap features an array of Dunham brewery beers as well as many other local and provincial favourites from L'Alchimiste to Charlevoix. Paired with the laid-back vibes, this place boasts the recipe for effortless and comfortable conversation between would-be lovers. Ten regularly rotated microbrews, cheap eats, dim lighting, a phenomenal terrace - what else could you possibly ask for date night? Try a pint of the Cimonak! smoked maple porter for dessert and bask in the aromas of your budding romance. This Verdun location offers the same great selection and unpretentious environment, however being on Rue Wellington gives you the added option of being able to take a romantic down the riverside path. And if nothing else, it sure is fun to order a pint of Ouate de Phoque. Relatively new on the scene, this spot has already made a name for itself. If you're looking for something to nibble on while you work your way through their 10 cask varieties, they have some solid eats to take your snacking to the wild side. With a menu that features rabbit wings and cubes of boars, along with the tried-and-true cheese plates, you're sure to find something to suit your fancy. And since it is nestled away in the historic Old Montreal, there is ample opportunity for starry-eyed lovers to take advantage of the scenic walks to and from the nuns' front door. Houblon, Eau, Levure, Malt - the four basic ingredients in any beer. As the name suggests, the beauty of simplicity is the driving force behind this brewery, and their pride in supporting local endeavours is reflected in everything their do. Their stock is brewed from predominantly Quebec grains, the menu is built from locally-grown and purchased ingredients. Heck, even the beers are named after streets and neighbourhoods around Montreal, so you two can take a wander through the city without ever leaving your barstool. With a modest selection on tap and several more recipes waiting in the wings, there is plenty of cleverly named swill waiting to be poured for you at this little neighbourhood pub. You'll fall in love with the casual environment where you can admire the revolving door of local art collections lining the walls. Toast winter goodbye with a pint of La Dernière Neige, or try glass of the Monty Python Holy Grail along your quest to find true romance. This cute little brewpub is notorious for making malty magic with cherries, and is currently featuring a black English-style Cherry Porter as part of their sequence of half dozen or so draft. Take a look at their modest snack food menu if you feel like breaking up the sips with a bite or two. Two words: Cream Ale Churros. This local favourite is pretty much the oldest microbrewery in town. The beer selection is a little more modest compared to many of the other options on the list, which is a blessing in disguise for those of us who find it overwhelming to make decisions when when there are too many choices. Try to catch them on a day that they are hosting live music events for a little something extra for your night out. The McAuslan Brewery came on the scene in 1989, setting up shop on Rue St-Ambroise with their eponymous blonde beer, and have been a household name ever since. So, what better place to get acquainted with the McAuslan beer family than the brewpub attached the the brewery itself? Located on the edge of the Lachine Canal, their terrace (set to open on the 1st of May!) is a thing of legend. Not only does this Vieux-Rosemont watering hole their update their dozen drafts selections on the regular, but they have a notable selection of scotch whiskeys and other local spirits, like Michel Jodoin apple brandy and ice cider, to consider if you're not feeling all beer all the tiem. Their menu does not offer much int he way of full meals, but there are a handful of tasty charcuterie-style snacks to pick at if the love in the air piques your appetite. Another cozy spot on Saint-Denis a stone's throw from the Berri metro station, this hidden gem with its lofty upstairs seating area has a little something for everyone. Beyond the microbrews, they have a modest wine menu along with an array a one litre cocktails that should definitely be on your hit list as the days grow warmer. Don't be alarmed when you realize their is beer menu though! The charming staff here are experts, ready to guide you through their 24 taps based on your flavour preferences. The curious name for this pub hiding away in Villeray is derived from the chemical name for Alcohol (Ethanol Hydroxide). But don't let the scientific propriety of the label fool you. Come in for the classy yet down-to-earth environment, which boasts 20 taps (all of which serve up local microbrews from Brasseur de Montreal to Jukebox to Dunham breweries, and a few of the ales are all their own), and stay for the array of tantalizing treats on the menu. Their sharable tapas platters pair nicely with canoodling, and it's also worth noting for G&T aficionados that these guys make their own tonic. Attention to detail is key to the folks, as they ensure that your beers are served at optimal temperature for their respective flavours. Though they obviously specialize in craft brews and whiskey, they do have a green tea kombucha flowing from from of their taps as well. Add a little food menu that is not limited to mac and cheese options (that include bacon by default, obvi), surf and turf, charcuterie plates, and the Samuel L. Jackson Royal with Cheese (find out for yourself), you have all the fixins of a delicious date night. Because the Hopfesntark Microbrewery is located 30 km outside Montreal in Lanaudière, this brewpub was established 7 years ago to be the Montreal go-to location for their beers. They specialize in quality beers that piggy-back the seasons, with malted, belgian-inspired and light and fruity flavours to choose from. With over 20 Hopfenstark varieties on tap, and a decent scotch selection, you'll be hard pressed to run out of things to try in this rustic little pub.